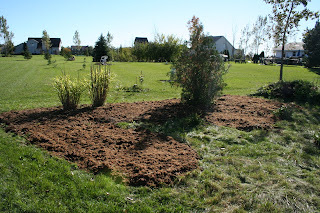 Sheet Mulching is my favorite way to convert areas over 50sq feet from lawn to garden space. 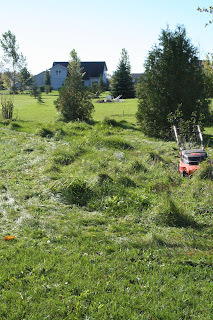 Rototilling in the sod, as with any extreme soil disturbance causes significant stress to the soil ecosystem, which is already in a state of crisis in most suburban lawns. Removing the sod is even worse due to the loss of what little ecosystem was in place, as well as the removal of significant amounts of organic matter that must now be replaced. Sheet mulching allows you to kill the existing vegetation, be it lawn or weeds, while keeping the soil ecosystem and organic matter intact. It is also a significant money saver as instead of purchasing yards and yards of topsoil, you are able to create it on site with waste products, and the finished product ends up better than anything you can have delivered anyhow. This past summer, I had the oppurtunity to take a significant amount of lawn, 1000+ sq ft, at a client’s house and begin to turn it into a perrenial bed. Round-Up is not an option in my world, so I pitched Sheet Mulch and it sold. 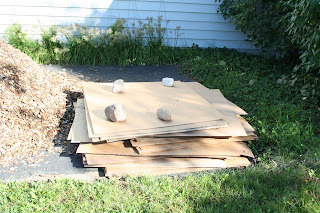 Here is a photo how to for a very simple, effective 3 ingredient Sheet Mulch with materials that are locally and readily availible here on the rural fringe of Suburbia: wood chips, cardboard pallet sheets, and horse manure. In this instance there was a horse farm literally a block away from the home, but the edges of suburbia are speckled with horse farms. Some neighborly conversation can get you access to a trailer load of manure prebasted with straw/sawdust for near perfect carbon:nitrogen ratio. It sounds nasty, and it can smell alittle ripe, but use a long fork and you will be fine. I spread it about 2″ thick, but feel free to go as much as 4″. More than that and you might go anaerobic as oxygen will not be able to penetrate it. 2″ deep for 1000 sq ft took about 5-6 yards or 3 loads with my trailer. That’s alot of forking, but you can’t beat the net returns! I like to use pallet sheets. Most warehouses, and some retailers-especially those who carry alot of pet food or other bagged product, will have these in abundance. Again, do some calling and make nice to see what you can turn up. Newspaper 4-7 sheets thick works great too, but pallet sheets are ink free, and don’t blow around as much in the wind, plus each sheet covers 16 sq ft so you cover ground quick. All natural carpet will also work-the trick is to cover the “Starter” with a breathable layer that is impenetrable to the plants below, but that will rot in a few months. I overlapped mine at least 6″ on all sides so it took the better part of 100 pallet sheets. The manure is thick with oat and hay seeds, this layer will keep them and the turf grasses out of the bed. Every muncipality out here has a free mulch pile for its residents. This municipality even had a backhoe on hand to fill my trailer with 2-3 yards of chips in about 5 minutes! I made 5 trips in 2 hours. Check out that windrow!! And, yes, my shoulders were sore as hell after this… The garden will get a 6-7″ layer of this that will settle to 5-6″. Spoiled or marsh hay, straw, etc would also work, but spoiled hay is alot harder to find if you aren’t Ruth Stout, and straw typically costs money. The thing on this layer is to make it Weed Free! Wood Chips take longer to break down, but they don’t blow around much and are a perfect medium for innoculating with edible mushrooms! Wow! That looks fantastic! Is there any other place to see/read more of the details of your incredible transformation? Hi. I just found your site (very cool!) and am trying to do something different with my nearly 2 acres (rather than continue to mow it!) Unfortunately at least a third of it has poison ivy (small and low growing because I keep mowing it, not above ground viney, although it might if there was something to grow up on). Do you have any experience with using your sheet mulch method to kill off poison ivy? There are also some wild grapevines out there…. I’d really like not to have it pushing its way up into my new perennial or food beds! (but like you, I’d rather not resort to chemical warfare). Our lawn is sod backed with green plastic mesh, so first I have to pull it all out and then intend to follow your guidelines. Thanks for sharing, with photos. Here’s to compost! Why would you need to pull out the green plastic mesh? Sheet mulch takes two things: time and material. In most cases those will be the limiting factors. Do you have 6 months to wait to plant? Do you have enough material to accomplish the sheet mulch? It is absolutely possible to transplant into a sheet mulch, but I would not use manure in that case, and I would use a faster degrading top layer – chopped straw or leaves would be ideal. Pull the mulch aside, cut an “x” into the weed barrier layer, fill the whole with some unsifted compost, and plant your new darling. Seeding into sheet mulch is also possible, though more difficult. Using materials similar to the transplant sheet mulch I just mentioned, put down a 1-2″ layer of sifted compost where you wish to plant and use this as your seed starting medium. By the time the roots need to get to the old sod layer, the weed barrier material should be degraded enough for them to punch through. I do not sheet mulch in my farming operations at this time due to the material issue – it would take tons of organic matter. That said, a deep mulch every winter does wonders for the soil and is highly encouraged. Good luck! Wait…they want us to not sheet mulch because there might be a shortage of cardboard? Do they not know there are container ships full of cardboard sitting in port cities languishing because there’s no market for it? We are not going to run out of cardboard to recycle. I think the five fridge boxes I used to mulch my new garden plot are causing a net reduction in pollution (from not shipping food year after year) – not increasing it because that, what, 35 pounds? of cardboard aren’t being recycled. Agreed – converting lawn to food production and rekindling the ecosystem of the soil is a higher use of the cardboard than making more fridge boxes. Emily may have become confused thinking that potential recycling and pollution reduction equated to the idea of a shortage. The ships of cardboard to China mean that ship loads of oil is saved, and pollution spared. This is why we must not jump to conclusions when reading things. Phil … like your leaves idea. In neighborhoods here, there are bags and bags available around the local community for free, pre-packaged and conveniently located. In fact, maybe leaves should be one of the top resources that cities should address, for alternative uses to merely sending away to compost heaps outside city limits. The smell of horse manure, to me, is rarely objectionable and is well contained under the cardboard and mulch. If the top layer is thick enough I recommend planting immediately, assuming as you said that you give them some soil to start with. 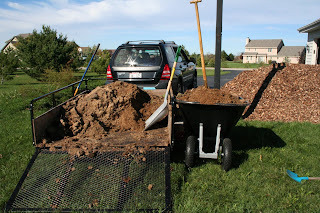 I have seen trees send roots 3′ up into mulch piles for the nutrients – you should be fine. Perennials I would cut through the cardboard in an “x” shape and pull the flaps up to plant the root ball into the soil beneath. This is only recommended if you do not have very persistent / aggressive weeds such as quack or couch grass that will find any and all openings to pop back through. in that case I would wait 4-6 months. I have decided to plant a vegetable garden this year and I would like to make my garden as eco friendly as possible. I recently closed my business and I have an abundance of used manila folders as well as six large garbage bags of shredded paper. I would like to know if I can use my manila folders for sheet mulch, and if so, how many would I need to layer. I would also like to find the best use for my many bags of shredded paper. If any one could give many any help with this, I would be forever grateful. Also, if it works for me, I will be sure to pass this knowledge onto as many people possible. Janet, I am sorry to hear about your business! Here are my thoughts. The shredded paper will make great mulch for your garden (wet it first) or for use in a vermicomposting endeavor. (To learn more read Mary Applehoff’s “Worm’s Eat My Garbage”). For the manilla envelopes, I would prefer to see them put to a higher use to honor the energy that was placed into creating them. Perhaps trading them with a local non-profit for some waste paper-newspaper preferred due to the size of sheets -its just easier– of theirs which would work well for your gardens as it would have less adhesives and/or metals. I’d like your advice. We are removing an invasive species, shining geranium and want to sheet compost on top of it. Some instructions for this include manure as the first layer and some do not. I’m wondering what the purpose of the manure layer is and if I need to include that step or if I can lay the cardboard or newspaper down first. You call the manure a “starter”, but I don’t know what we’d be starting and if it’s necessary. The manure is a soil building layer that rockets the soil life into action with a huge kick of nutrients, especially nitrogen and organic matter which is lacking in most denuded soils. If you are focusing primarily on smothering, then you can certainly skip that layer, and I would recommend strengthening, even as much as doubling the weed barrier layer to ensure you kill it dead. I often kill quack with a double layer of cardboard with a 4-6″ layer of wood chips on top. In 1-2 years there is a 1/2″ of humus and a VERY robust mycelial net in place which is another great way to sheet mulch, and even simpler. Good luck and THANK YOU for not resorting to herbicides first! I sheet mulch all of my beds in my yard but my issue is that the quack grass in my grass slowly creeps back into my flower beds from the lawn side by growing in between the news paper I have put down and the mulch on top of it. There is no quack coming through the paper, only on top of it. What would you suggest for keeping the quack grass out of the mulched areas? Quack is my nemesis. Constant vigilance works ok , but take a summer off and you are in for it! For our veggie garden I broke down this year and am installing a rhizome barrier of 12″ wide aluminum roof flashing. I pull after every deep rain which work ok in established beds – once the plants are mature and the soil is healthy quack tends to look elsewhere. Good luck! While I’ve container-gardened for years, we’ve just purchased two acres (mostly lawn/pasture) and are new to large scale gardening. Could I substitute cow manure for the horse manure? The neighboring cow shed is about 20 feet from my proposed garden location….the horse farm is a couple miles down the road. Or do I need to be concerned about e. coli? Congrats on the move! Cow manure will work fine, though it is significantly higher in nitrogen and may need to be cut with some straw or leaves if it is not already. For soil building it will work fine – the extra nitrogen will do wonders, but I would ensure you have leaves, woodchips, or straw in there somewhere as that tougher material takes far longer to break down and accelerates humus building and soil structure. My main concern with cows is the amount of antibiotics that they are fed, as well as the GM corn and soybeans in their diet. Horses are typically spared the drug soup and have more access to pasture. If the cows are Organic, primarily grass fed and/or the owners are able to answer the drug question to your satisfaction than it would be fine. The drugs for cattle are typically literally in the food they are given from the feed mill, so some animal farmers are not even aware of what is going into their animals and the hyper resistant bacteria they may be inadvertently breeding. Thank you. I shall ask a few questions about the cows, but it might work. They’re currently mowing/fertilizing my field, and their diet appears to be mostly hay. But there is some supplemental feed, and I don’t know how much of that he grows himself, or what he may or may not add to it. (This is not a highly industrialized operation, to say the least.) As an added bonus, a chat last week with the farmer revealed the existence of a hay field that passed it’s usable stage, but which he’s going to cut anyway, just to clean things up. Now, on to the cardboard….and the planning. Going to the library today for the Hemenway permaculture book. Thank you for creating such a richly informative site. I have about 600 square feet of lawn that can no longer grow as the soil is compacted clay. I am considering sheet mulching to create a small patch of grass surrounded by a large planting border. Will this method work on the area where I want to replant the grass? I certainly could be used for any plant – the issue will be the need to use a very light top mulch as sheet mulch is typically used to transplant into. It would likely be best to sheet mulch a season in advance, then pull the mulch back to seed and cover with a light dusting of straw. 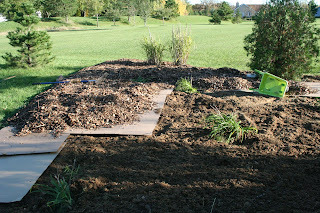 I am planning my first sheet mulch bed this week. I have some horse, goat, sheep, and rabbit manure coming my way. The animals haven’t been wormed in quite awhile. The farmer said it will be full of weed seeds, is that a big problem? He also said I should apply lime as the ph will be thrown off. I plan on using cardboard then 4 or so inches of leaves. Should I worry, or will the next few months take care of my problems. I plan on making this my sunflower garden, I hope the seeds I harvested will sprout. I’m on board! I found your site just a few days after my horsey neighbor dumped about 8 cu. yds. of manure and bedding onto my 1,400 sq. ft. garden. I was looking for an alternative that didn’t involve shoveling all of the material four or five times in heaps. Even better if I can prevent all those weed seeds from sprouting. Already I’ve gathered a dozen large boxes and pallet sheets from PetsMart, so it’s all shaping up according to plan. I look forward to a greatly enriched garden next season. 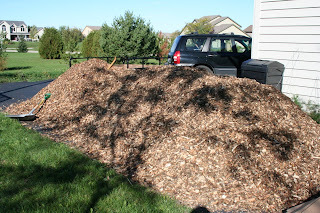 If only my municipal mulch pile had curb service! Where are you? That might have some influence on the time it takes for the cardboard to break down. I”m in Denver, Colorado, which seems to have about the same climate as Arizona these days. I just watered the manure sheet for a half hour, and I guess I may need to water the whole thing every week that the snows don’t come. What do you think about the moisture factor? That sounds great John! I am in southern Wisconsin – Zone 5b- near Madison. Once the cardboard and top mulch are wet, that should be it assuming the manure was good and damp. Too wet and it won’t breathe and it will turn into an anaerobic mess which will not be good for the garden. More important than location (barring extremes) is soil microbe health. If your soils are dead it can take a year, but the manure will be VERY microbial rich and will help the material break down. Cover the cardboard with straw, soak that, and I would be surprised if the cardboard isn’t all but gone by when you want to plant in May/June. Spring crops may need a layer of compost over the straw, or the cardboard removed from the section and 1″ of compost or topsoil applied for a seedbed. Try to till it as little as possible as horse manure is full of seeds (enough seeds pass through one horse to keep 3-4 chickens alive). You’re garden next year will be AWESOME. Straw isn’t my first choice for mulch. I’d have to buy it, and my windy location might be a bad place to keep it under control. My town shreds surplus trees to feed the free mulch pile nearby. Because Western soil is typically alkaline, I’m waiting until early January when the pile is deep with fresh, acidic pine from old Christmas trees. I see no evidence of composting progress in my sheet mulch, but it has been cold at night. Most of the biological work will probably occur in spring. But the layer of cardboard sheets is doing a lot to conserve soil moisture. Denver has gotten only two inches of snow so far (about 1/4 inch of moisture), and it stopped raining here in mid-July. Gardening out here seems like an increasingly audacious and iffy activity!